In many year five classrooms, kids study state history as part of their social studies curriculum, and teachers often use lots of hands-on activities to bring the past to life. Here’s one project that may be a little challenging for today’s fourth graders, but was a common craft for children in the eighteenth and nineteenth centuries: make a handcrafted potholder! There are a multitude of quilt designs to choose from, but this one comes from the Amish of Pennsylvania who were (and are) devoted to a lifestyle of simplicity. The Amish used only solid colored fabric in their work and continue to do so today. This potholder activity gives kids practise in calculating measurement, an important skill in both elementary maths and science. Once your child has completed this potholder, don’t hesitate to do others with her—each one will be one more useful step to maths mastery. First, create the patchwork piece. 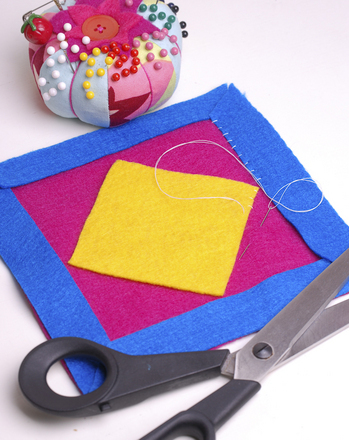 Start by folding the 5-1/2” square along its diagonal to make a crease separating two triangles. 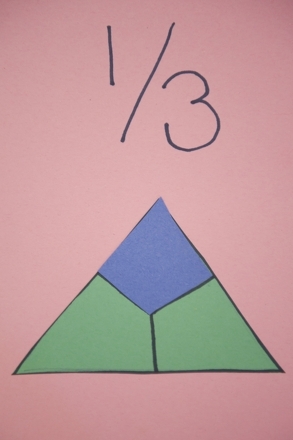 Then fold each triangle in half to make a total of four triangles. 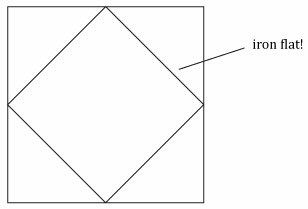 Place the long side of one triangle against one side of the 4-1/2” square so that their edges line up. 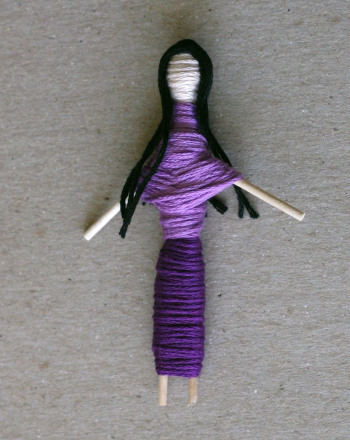 Using either a needle or a sewing machine, sew them together with a ¼” seam, like this. For a truly authentic experience, be sure to sew by hand. Repeat this step with each of the other triangles, along each of the other sides of the square. When you’re done, fold all the edges out and use an iron to make them smooth and flat. Now you’re ready for the “potholder sandwich". To start, place the 10” square on a table surface and smooth it flat. Place two or three thin batting sheets in a pile centered on the 10” fabric piece, then centre the patchwork piece on top of everything. 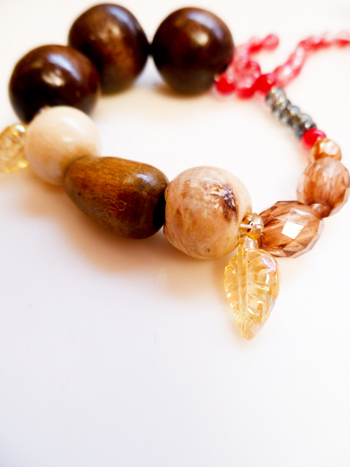 Choose one corner and sew on the ring. 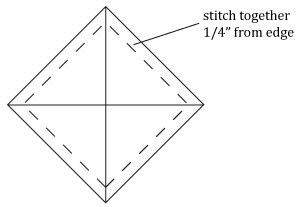 Then, in the middle of the square and in each side triangle, use your needle and thread to make one stitch, reinforced several times, through all three layers of the potholder, so that nothing can shift. 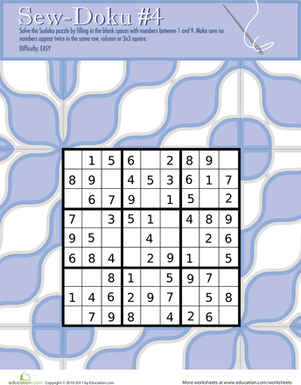 Challenge your fourth grader to "sew" up a snazzy Sudoku puzzle! 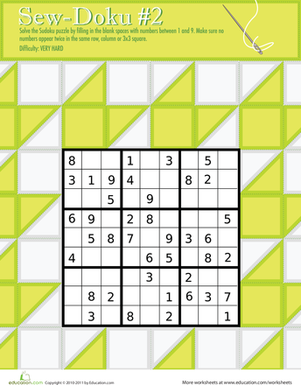 Sew together some critical thinking and problem solving skills along with some basic maths practise as you solve this fun sudoku puzzle. 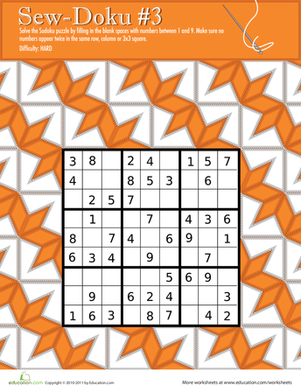 Give your fourth grader some inconspicuous practise with numbers with this colorful Sudoku puzzle! "Sewing" up this Japanese number placement game is a project that will boost both your child's critical thinking and problem solving skills! Don't despair if numerators and denominators seem like a bore to your child. This colorful collage is sure to show him the brighter side of fractions. This colorful diagram is a handy reference guide for kids learning basic body systems. Fill in the blanks with the Spanish words for various colorful objects.